Belize (/bəˈliːz/ ( listen)) is a country located on the eastern coast of Central America. Belize is bordered on the northwest by Mexico, on the east by the Caribbean Sea, and on the south and west by Guatemala. It has an area of 22,970 square kilometres (8,867 sq mi) and a population of 387,879 (2017). Its mainland is about 180 mi (290 km) long and 68 mi (110 km) wide. 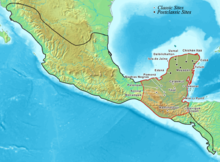 It has the lowest population and population density in Central America. The country’s population growth rate of 1.87% per year (2015) is the second highest in the region and one of the highest in the Western Hemisphere. The Mayan civilization spread into the area of Belize between 1500 B.C. and 300 A.D. and flourished until about 1200. European exploration campaigns began in 1502 when Christopher Columbus sailed along the Gulf of Honduras. European settlement was begun by English settlers in 1638. This period was also marked by Spain and Britain both laying claim to the land until Britain defeated the Spanish in the Battle of St. George’s Caye (1798). It became a British colony in 1840, known as British Honduras, and a Crown colony in 1862. Independence was achieved from the United Kingdom on 21 September 1981. Belize’s abundance of terrestrial and marine species and its diversity of ecosystems give it a key place in the globally significant Mesoamerican Biological Corridor. It is considered a Central American and Caribbean nation with strong ties to both the American and Caribbean regions. It is a member of the Caribbean Community (CARICOM), the Community of Latin American and Caribbean States (CELAC), and the Central American Integration System (SICA), the only country to hold full membership in all three regional organisations. Belize is a Commonwealth realm, with Queen Elizabeth II as its monarch and head of state. The earliest known record of the name “Belize” appears in the journal of the Dominican priest Fray José Delgado, dating to 1677. Delgado recorded the names of three major rivers that he crossed while travelling north along the Caribbean coast: Rio Soyte, Rio Xibum and Rio Balis. The names of these waterways, which correspond to the Sittee River, Sibun River and Belize River, were provided to Delgado by his translator. It is likely that Delgado’s “Balis” was actually the Mayan word belix (or beliz), meaning “muddy-watered”. Some have suggested that the name derives from a Spanish pronunciation of the name of the Scottish buccaneer , who established a settlement at the mouth of the Belize River in 1638. There is no proof that Wallace settled in this area and some scholars have characterized this claim as a myth. Writers and historians have suggested several other possible etymologies, including postulated French and African origins. 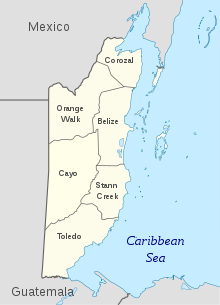 When Spanish explorers arrived in the 16th century, the area that is now Belize included three distinct Maya territories: , which encompassed the area around Corozal Bay; , which encompassed the area between the New River and the Sibun River, west to Tipu; and a southern territory controlled by the Manche Ch’ol Maya, encompassing the area between the Monkey River and the Sarstoon River. The British first appointed a superintendent over the Belize area in 1786. Before then the British government had not recognized the settlement as a colony for fear of provoking a Spanish attack. The delay in government oversight allowed the settlers to establish their own laws and forms of government. During this period, a few successful settlers gained control of the local legislature, known as the Public Meeting, as well as of most of the settlement’s land and timber. The Battle of St. George’s Caye was a 1798 military engagement off the coast of Belize between an invading Spanish fleet and a small force of Baymen and their slaves. From 3 to 5 September, the Spaniards tried to force their way through Montego Caye shoal, but were blocked by defenders. Spain’s last attempt occurred on 10 September, when the Baymen repelled the Spanish fleet in a short engagement with no known casualties on either side. The anniversary of the battle is a national holiday in Belize and is celebrated to commemorate the “first Belizeans” and the defence of their territory. In the early 19th century, the British sought to reform the settlers, threatening to suspend the Public Meeting unless it observed the government’s instructions to eliminate slavery outright. After a generation of wrangling, slavery was abolished in the British Empire in 1833. As a result of their slaves’ abilities in the work of mahogany extraction, owners in British Honduras were compensated at £53.69 per slave on average, the highest amount paid in any British territory. However, the end of slavery did little to change the former slaves’ working conditions if they stayed at their trade. A series of institutions restricted the ability of individuals to buy land, in a debt-peonage system. Former “extra special” mahogany or logwood cutters undergirded the early ascriptions of the capacities (and consequently the limitations) of people of African descent in the colony. Because a small elite controlled the settlement’s land and commerce, former slaves had little choice but to continue to work in timber cutting. As a colony, Belize began to attract British investors. Among the British firms that dominated the colony in the late 19th century was the Belize Estate and Produce Company, which eventually acquired half of all privately held land and eventually eliminated peonage. Belize Estate’s influence accounts in part for the colony’s reliance on the mahogany trade throughout the rest of the 19th century and the first half of the 20th century. The Great Depression of the 1930s caused a near-collapse of the colony’s economy as British demand for timber plummeted. The effects of widespread unemployment were worsened by a devastating hurricane that struck the colony in 1931. Perceptions of the government’s relief effort as inadequate were aggravated by its refusal to legalize labour unions or introduce a minimum wage. Economic conditions improved during World War II as many Belizean men entered the armed forces or otherwise contributed to the war effort. Following the war, the colony’s economy stagnated. Britain’s decision to devalue the British Honduras dollar in 1949 worsened economic conditions and led to the creation of the People’s Committee, which demanded independence. The People’s Committee’s successor, the People’s United Party (PUP), sought constitutional reforms that expanded voting rights to all adults. The first election under universal suffrage was held in 1954 and was decisively won by the PUP, beginning a three-decade period in which the PUP dominated the country’s politics. Pro-independence activist George Cadle Price became PUP leader in 1956 and the effective head of government in 1961, a post he would hold under various titles until 1984. The UDP regained power in the 1993 national election, and Esquivel became prime minister for a second time. Soon afterwards, Esquivel announced the suspension of a pact reached with Guatemala during Price’s tenure, claiming Price had made too many concessions to gain Guatemalan recognition. The pact may have curtailed the 130-year-old border dispute between the two countries. Border tensions continued into the early 2000s, although the two countries cooperated in other areas. In 2005, Belize was the site of unrest caused by discontent with the PUP government, including tax increases in the national budget. On 8 February 2008, Dean Barrow was sworn in as prime minister after his UDP won a landslide victory in general elections. Barrow and the UDP were re-elected in 2012 with a considerably smaller majority. Barrow led the UDP to a third consecutive general election victory in November 2015, increasing the party’s number of seats from 17 to 19. However he stated the election would be his last as party leader and preparations are under way for the party to elect his successor. Members of the independent judiciary are appointed. The judicial system includes local magistrates grouped under the Magistrates’ Court, which hears less serious cases. The Supreme Court (Chief Justice) hears murder and similarly serious cases, and the Court of Appeal hears appeals from convicted individuals seeking to have their sentences overturned. Defendants may, under certain circumstances, appeal their cases to the Caribbean Court of Justice. Since 1974, the party system in Belize has been dominated by the centre-left People’s United Party and the centre-right United Democratic Party, although other small parties took part in all levels of elections in the past. Though none of these small political parties has ever won any significant number of seats and/or offices, their challenge has been growing over the years. Belize is a full participating member of the United Nations, Commonwealth of Nations, Organization of American States (OAS), Central American Integration System (SICA), Caribbean Community (CARICOM), CARICOM Single Market and Economy (CSME), Association of Caribbean States (ACS), and the Caribbean Court of Justice (CCJ), which currently serves as a final court of appeal for only Barbados, Belize, and Guyana. In 2001 the Caribbean Community heads of government voted on a measure declaring that the region should work towards replacing the UK’s Judicial Committee of the Privy Council with the Caribbean Court of Justice. It is still in the process of acceding to CARICOM and SICA treaties, including trade and single market treaties. The Belize Defence Force (BDF) serves as the country’s military and is responsible for protecting the sovereignty of Belize. The BDF, with the Belize National Coast Guard and the Immigration Department, is a department of the Ministry of Defence and Immigration. In 1997 the regular army numbered over 900, the reserve army 381, the air wing 45 and the maritime wing 36, amounting to an overall strength of approximately 1400. In 2005, the maritime wing became part of the Belizean Coast Guard. In 2012, the Belizean government spent about $17 million on the military, constituting 1.08% of the country’s gross domestic product (GDP). The Guatemalan territorial claim involves approximately 53% of Belize’s mainland, which includes significant portions of four districts: Belize, Cayo, Stann Creek, and Toledo. Roughly 43% of the country’s population (≈154,949 Belizeans) reside in this region. As of 2016, the border dispute with Guatemala remains unresolved and quite contentious. Guatemala’s claim to Belizean territory rests, in part, on Clause VII of the Anglo-Guatemalan Treaty of 1859, which obligated the British to build a road between Belize City and Guatemala. At various times, the issue has required mediation by the United Kingdom, Caribbean Community heads of government, the Organization of American States (OAS), Mexico, and the United States. However, on 15 April 2018, Guatemala’s government held a referendum to determine if the country should take its territorial claim on Belize to the International Court of Justice (ICJ) to settle the long-standing issue. Guatemalans voted yes on the matter. A similar referendum was to be held in Belize on 10 April 2019, but a court ruling led to its postponement. Prime Minister Barrow said he expected the referendum to be held “no later than six to eight weeks” afterward. Belize backed the United Nations (UN) Declaration on the Rights of Indigenous Peoples in 2007, which established legal land rights to indigenous groups. Other court cases have affirmed these rights like the Supreme Court of Belize‘s 2013 decision to uphold its ruling in 2010 that acknowledges customary land titles as communal land for indigenous peoples. Another such case is the Caribbean Court of Justice‘s (CCJ) 2015 order on the Belizean government, which stipulated that the country develop a land registry to classify and exercise traditional governance over Mayan lands. Despite these rulings, Belize has made little progress to support the land rights of indigenous communities; for instance, in the two years since the CCJ’s decision, Belize’s government has been stagnant to launch the Mayan land registry, rendering the group to take action into its own hands. The exact ramifications of these cases need to be examined. As of 2017, Belize still struggles to recognize indigenous populations and their respective rights. According to the 50-page voluntary national report Belize created on its progress toward the UN’s 2030 Sustainable Development Goals, indigenous groups are not factored into the country’s indicators whatsoever. In fact, the groups ‘Creole’ and ‘Garinagu’ are not included in the document, and ‘Maya’ and ‘Mestizo’ only occur once throughout the entirety of the report. It is yet to be seen if the Belizean government will highlight the consequences of the territorial claim on indigenous land rights prior to the referendum vote in 2019. Belize is shaped like a rectangle that extends about 174 miles (280 km) north-south and about 62 miles (100 km) east-west, with a total land boundary length of 321 miles (516 km). The undulating courses of two rivers, the Hondo and the Sarstoon River, define much of the course of the country’s northern and southern boundaries. The western border follows no natural features and runs north-south through lowland forest and highland plateau. The north of Belize consists mostly of flat, swampy coastal plains, in places heavily forested. The flora is highly diverse considering the small geographical area. The south contains the low mountain range of the Maya Mountains. 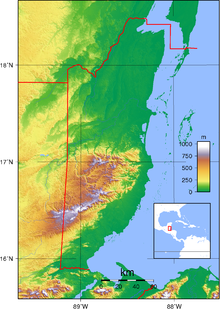 The highest point in Belize is Doyle’s Delight at 3,688 ft (1,124 m). Belize’s rugged geography has also made the country’s coastline and jungle attractive to drug smugglers, who use the country as a gateway into Mexico. In 2011, the United States added Belize to the list of nations considered major drug producers or transit countries for narcotics. 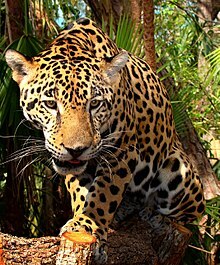 Belize has a rich variety of wildlife because of its unique position between North and South America and a wide range of climates and habitats for plant and animal life. Belize’s low human population and approximately 8,867 square miles (22,970 km2) of undistributed land make for an ideal home for the more than 5,000 species of plants and hundreds of species of animals, including armadillos, snakes, and monkeys. While over 60% of Belize’s land surface is covered by forest, some 20% of the country’s land is covered by cultivated land (agriculture) and human settlements. Savanna, scrubland and wetland constitute the remainder of Belize’s land cover. Important mangrove ecosystems are also represented across Belize’s landscape. As a part of the globally significant Mesoamerican Biological Corridor that stretches from southern Mexico to Panama, Belize’s biodiversity – both marine and terrestrial – is rich, with abundant flora and fauna. Belize is also a leader in protecting biodiversity and natural resources. According to the World Database on Protected Areas, 37% of Belize’s land territory falls under some form of official protection, giving Belize one of the most extensive systems of terrestrial protected areas in the Americas. By contrast, Costa Rica only has 27% of its land territory protected. Around 13.6% of Belize’s territorial waters, which contain the Belize Barrier Reef, are also protected. The Belize Barrier Reef is a UNESCO-recognized World Heritage Site and is the second-largest barrier reef in the world, behind Australia‘s Great Barrier Reef. A remote sensing study conducted by the Water Center for the Humid Tropics of Latin America and the Caribbean (CATHALAC) and NASA, in collaboration with the Forest Department and the Land Information Centre (LIC) of the government of Belize’s Ministry of Natural Resources and the Environment (MNRE), and published in August 2010 revealed that Belize’s forest cover in early 2010 was approximately 62.7%, down from 75.9% in late 1980. A similar study by Belize Tropical Forest Studies and Conservation International revealed similar trends in terms of Belize’s forest cover. Both studies indicate that each year, 0.6% of Belize’s forest cover is lost, translating to the clearing of an average of 24,835 acres (38.805 sq mi; 100.50 km2) each year. The USAID-supported study by CATHALAC, NASA, and the MNRE also showed that Belize’s protected areas have been extremely effective in protecting the country’s forests. While only some 6.4% of forests inside of legally declared protected areas were cleared between 1980 and 2010, over a quarter of forests outside of protected areas were lost between 1980 and 2010. As a country with a relatively high forest cover and a low deforestation rate, Belize has significant potential for participation in initiatives such as REDD. Significantly, the SERVIR study on Belize’s deforestation was also recognized by the Group on Earth Observations (GEO), of which Belize is a member nation. It is Belize’s top tourist destination, popular for scuba diving and snorkelling, and attracting almost half of its 260,000 visitors. It is also vital to its fishing industry. In 1842 Charles Darwin described it as “the most remarkable reef in the West Indies“. Despite these protective measures, the reef remains under threat from oceanic pollution as well as uncontrolled tourism, shipping, and fishing. Other threats include hurricanes, along with global warming and the resulting increase in ocean temperatures, which causes coral bleaching. It is claimed by scientists that over 40% of Belize’s coral reef has been damaged since 1998. Average rainfall varies considerably, from 53 inches (1,350 mm) in the north and west to over 180 inches (4,500 mm) in the extreme south. Seasonal differences in rainfall are greatest in the northern and central regions of the country where, between January and April or May, less than 3.9 inches (100 mm) of rainfall per month. The dry season is shorter in the south, normally only lasting from February to April. A shorter, less rainy period, known locally as the “little dry”, usually occurs in late July or August, after the onset of the rainy season. A sugar cane processing plant, Orange Walk Town, Belize. Sugar is one of Belize’s top exports. The new government of Belize faces important challenges to economic stability. Rapid action to improve tax collection has been promised, but a lack of progress in reining in spending could bring the exchange rate under pressure. The tourist and construction sectors strengthened in early 1999, leading to a preliminary estimate of revived growth at four percent. Infrastructure remains a major economic development challenge; Belize has the region’s most expensive electricity. Trade is important and the major trading partners are the United States, Mexico, the European Union, and Central America. Belize is located on the coast of Central America. Based on its location, it is seen as a beautiful destination for vacations. However, also due to its location, it is currently becoming known in the global arena for attracting many drug trafficking entities in North America. The Belize currency is pegged to the U.S. dollar. This entices drug traffickers and money launderers who want to utilize their current economic system. In addition, Belize also offers nonresidents the ability to establish offshore accounts. Because of this loophole, it is desirable for many drug traffickers and money launderers to utilize Belize as a money laundering banking entity. As a result, the United States Department of State has recently named Belize one of the world’s “major money laundering countries.” 2016 World Fact Book of the United States Central Intelligence Agency. On 14 June 2011, the government of Belize nationalized the majority ownership interest of Fortis Inc. in Belize Electricity Ltd. The Belize utility encountered serious financial problems after the country’s Public Utilities Commission (PUC) in 2008 disallowed “the recovery of previously incurred fuel and purchased power costs in customer rates and set customer rates at a level that does not allow BEL to earn a fair and reasonable return”, Fortis said in a June 2011 statement. BEL appealed this judgment to the Court of Appeal; however, a hearing is not expected until 2012. In May 2011, the Supreme Court of Belize granted BEL’s application to prevent the PUC from taking any enforcement actions pending the appeal. The Belize Chamber of Commerce and Industry issued a statement saying the government had acted in haste and expressed concern over the message it sent to investors. 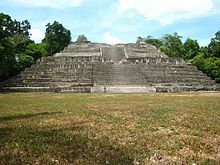 The Maya are thought to have been in Belize and the Yucatán region since the second millennium BC; however, much of Belize’s original Maya population was wiped out by conflicts between constantly warring tribes. There were many who died of disease after contact and invasion by Europeans. Three Maya groups now inhabit the country: The Yucatec (who came from Yucatán, Mexico, to escape the savage Caste War of the 1840s), the Mopan (indigenous to Belize but were forced out to Guatemala by the British for raiding settlements; they returned to Belize to evade enslavement by the Guatemalans in the 19th century), and Q’eqchi’ (also fled from slavery in Guatemala in the 19th century). The latter groups are chiefly found in the Toledo District. The Maya speak their native languages and Spanish, and are also fluent in English and Belize Kriol. Because Roatán was too small and infertile to support their population, the Garinagu petitioned the Spanish authorities of Honduras to be allowed to settle on the mainland coast. The Spanish employed them as soldiers, and they spread along the Caribbean coast of Central America. The Garinagu settled in Seine Bight, Punta Gorda and Punta Negra, Belize, by way of Honduras as early as 1802. However, in Belize, 19 November 1832 is the date officially recognized as “Garifuna Settlement Day” in Dangriga. The Mestizo culture are people of mixed Spanish and Maya descent. They originally came to Belize in 1847, to escape the Caste War, which occurred when thousands of Mayas rose against the state in Yucatán and massacred over one-third of the population. The surviving others fled across the borders into British territory. The Mestizos are found everywhere in Belize but most make their homes in the northern districts of Corozal and Orange Walk. Some other mestizos came from El Salvador, Guatemala, Honduras, & Nicaragua. The Mestizos are the largest ethnic group in Belize and make up approximately half of the population. The Mestizo towns centre on a main square, and social life focuses on the Catholic Church built on one side of it. Spanish is the main language of most Mestizos and Spanish descendants, but many speak English and Belize Kriol fluently. Due to the influences of Kriol and English, many Mestizos speak what is known as “Kitchen Spanish”. The mixture of Latin and Maya foods like tamales, escabeche, chirmole, relleno, and empanadas came from their Mexican side and corn tortillas were handed down by their Mayan side. Music comes mainly from the marimba, but they also play and sing with the guitar. Dances performed at village fiestas include the Hog-Head, Zapateados, the Mestizada, Paso Doble and many more. The remaining 5% or so of the population consist of a mix of Indians, Chinese, Whites from the United Kingdom, United States and Canada, and many other foreign groups brought to assist the country’s development. During the 1860s, a large influx of East Indians who spent brief periods in Jamaica and American Civil War veterans from Louisiana and other Southern states established Confederate settlements in British Honduras and introduced commercial sugar cane production to the colony, establishing 11 settlements in the interior. The 20th century saw the arrival of more Asian settlers from mainland China, South Korea, India, Syria, and Lebanon. Said Musa, the son of an immigrant from Palestine, was the Prime Minister of Belize from 1998 to 2008. Central American immigrants from El Salvador, Guatemala, Honduras, & Nicaragua and expatriate Americans and Africans also began to settle in the country. Approximately 50% of Belizeans self-identify as Mestizo, Latino, or Hispanic and 30% speak Spanish as a native language. When Belize was a British colony, Spanish was banned in schools but today it is widely taught as a second language. “Kitchen Spanish” is an intermediate form of Spanish mixed with Belizean Creole, spoken in the northern towns such as Corozal and San Pedro. Belize is also home to three Mayan languages: Q’eqchi’, Mopan (an endangered language), and Yucatec Maya. Approximately 16,100 people speak the Arawakan-based Garifuna language, and 6,900 Mennonites in Belize speak mainly Plautdietsch while a minority of Mennonites speak Pennsylvania German. According to the 2010 census, 40.1% of Belizeans are Roman Catholics, 31.8% are Protestants (8.4% Pentecostal; 5.4% Adventist; 4.7% Anglican; 3.7% Mennonite; 3.6% Baptist; 2.9% Methodist; 2.8% Nazarene), 1.7% are Jehovah’s Witnesses, 10.3% adhere to other religions (Maya religion, , Obeah and , and minorities of Mormons, Hindus, Buddhists, Muslims, Bahá’ís, Rastafarians and other) and 15.5% profess to be irreligious. The Association of Religion Data Archives estimates there were 7,776 Bahá’ís in Belize in 2005, or 2.5% of the national population. Their estimates suggest this is the highest proportion of Bahá’ís in any country. Their data also states that the Bahá’í Faith is the second most common religion in Belize, followed by Judaism. Hinduism is followed by most Indian immigrants, however, Sikhs were the first Indian immigrants to Belize (not counting indentured workers), and the former Chief Justice of Belize George Singh was the son of a Sikh immigrant, there was also a Sikh cabinet minister. Muslims claim that there have been Muslims in Belize since the 16th century having been brought over from Africa as slaves, but there are no sources for that claim. The Muslim population of today started the 1980s. Muslims numbered 243 in 2000 and 577 in 2010 according to the official statistics. and comprise 0.16 percent of the population. A mosque is at the Islamic Mission of Belize (IMB), also known as the Muslim Community of Belize. Another mosque, Masjid Al-Falah, officially opened in 2008 in Belize City. A number of kindergartens, secondary, and tertiary schools in Belize provide quality education for students—mostly funded by the government. Belize has about a dozen tertiary level institutions, the most prominent of which is the University of Belize, which evolved out of the University College of Belize founded in 1986. Before that St. John’s College, founded in 1877, dominated the tertiary education field. The Open Campus of the University of the West Indies has a site in Belize. It also has campuses in Barbados, Trinidad, and Jamaica. The government of Belize contributes financially to the UWI. The educational policy is currently following the “Education Sector Strategy 2011–2016”, which sets three objectives for the years to come: Improving access, quality, and governance of the education system by providing technical and vocational education and training. The Belize Police Department has implemented many protective measures in hopes of decreasing the high number of crimes. These measures include adding more patrols to “hot spots” in the city, obtaining more resources to deal with the predicament, creating the “Do the Right Thing for Youths at Risk” program, creating the Crime Information Hotline, creating the Yabra Citizen Development Committee, an organisation that helps youth, and many other initiatives. The Belize Police Department began an Anti-Crime Christmas campaign targeting criminals; as a result, the crime rates dropped in that month. In 2011, the government established a truce among many major gangs, lowering the murder rate. Belize’s social structure is marked by enduring differences in the distribution of wealth, power, and prestige. Because of the small size of Belize’s population and the intimate scale of social relations, the social distance between the rich and the poor, while significant, is nowhere as vast as in other Caribbean and Central American societies, such as Jamaica and El Salvador. Belize lacks the violent class and racial conflict that has figured so prominently in the social life of its Central American neighbours. As of 2013, 48.3% of women in Belize participate in the workforce, compared to 81.8% of men. 13.3% of the seats in Belize’s National Assembly are filled by women. In Belizean folklore, there are the legends of Lang Bobi Suzi, La Llorona, La Sucia, Tata Duende, X’tabai, Anansi, Xtabay, Sisimite and the cadejo. Breakfast typically consists of bread, flour tortillas, or fry jacks that are often homemade. Fry jacks are eaten with various cheeses, refried beans, various forms of eggs or cereal, along with powdered milk, coffee, or tea. 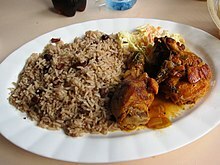 Midday meals vary, from foods such as rice and beans with or without coconut milk, tamales (fried maize shells with beans or fish), “panades”, meat pies, escabeche (onion soup), chimole (soup), caldo, stewed chicken and garnaches (fried tortillas with beans, cheese, and sauce) to various constituted dinners featuring some type of rice and beans, meat and salad or coleslaw. The Cross Country Cycling Classic, also known as the “cross country” race or the Holy Saturday Cross Country Cycling Classic, is considered one of the most important Belize sports events. This one-day sports event is meant for amateur cyclists but has also gained worldwide popularity. The history of Cross Country Cycling Classic in Belize dates back to the period when Monrad Metzgen picked up the idea from a small village on the Northern Highway (now Phillip Goldson Highway). The people from this village used to cover long distances on their bicycles to attend the weekly game of cricket. He improvised on this observation by creating a sporting event on the difficult terrain of the Western Highway, which was then poorly built. The Belize national basketball team is the only national team that has achieved major victories internationally. The team won the 1998 CARICOM Men’s Basketball Championship, held at the Civic Center in Belize City, and subsequently participated in the 1999 Centrobasquet Tournament in Havana. The national team finished seventh of eight teams after winning only 1 game despite playing close all the way. In a return engagement at the 2000 CARICOM championship in Barbados, Belize placed fourth. Shortly thereafter, Belize moved to the Central American region and won the Central American Games championship in 2001. The national flower is the black orchid (Prosthechea cochleata, also known as Encyclia cochleata). The national tree is the mahogany tree (Swietenia macrophylla), which inspired the national motto Sub Umbra Floreo, which means “Under the shade I flourish”. 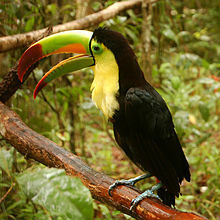 The national animal is the Baird’s tapir and the national bird is the keel-billed toucan (Ramphastos sulphuratus). ^ In April 2019, a media outlet showed video of Guatemalan President Jimmy Morales showing students how to draw Guatemala’s map to include all of Belize, reflecting his country’s claim. ^ a b c “Belize”. CIA World Factbook. Central Intelligence Agency. Archived from the original on 13 May 2013. Retrieved 13 January 2016. ^ a b c d “Belize Population and Housing Census 2010: Country Report” (PDF). Statistical Institute of Belize. 2013. Archived from the original (PDF) on 27 January 2016. Retrieved 11 December 2014. ^ a b c d “Belize”. International Monetary Fund. ^ “World Population Prospects: The 2008 Revision Population Database”. United Nations. March 11, 2009. Archived from the original on 19 August 2010. Retrieved 29 August 2010. Bolland, Nigel (January 1992). Tim Merrill, ed. “Belize: Historical Setting”. A Country Study: Belize. Library of Congress Federal Research Division. ^ Byrd Downey, Cristopher (22 May 2012). Stede Bonnet: Charleston’s Gentleman Pirate. The History Press. p. 44. ISBN 1609495403. Retrieved 25 March 2016. ^ Woodard, Colin. “A Blackbeard mystery solved”. Republic of Pirates Blog. Retrieved 25 March 2016. ^ “Reid between the lines”. Belize Times. 27 January 2012. Archived from the original on 10 May 2013. ^ Ryan, Jennifer (1995). “The Garifuna and Creole culture of Belize explosion of punta rock”. In Will Straw; Stacey Johnson; Rebecca Sullivan; Paul Friedlander; Gary Kennedy. Popular Music: Style and Identity. pp. 243–248. ISBN 978-0771704598. ^ “Ecosystem Mapping.zip”. Retrieved 3 July 2012. ^ “CARICOM – Member Country Profile – BELIZE”. www.caricom.org. CARICOM. Archived from the original on 18 February 2015. Retrieved 17 February 2015. ^ “British Honduras”. Encyclopædia Britannica. 12. New York: The Britannica Publishing Company. 1892. Retrieved 25 October 2010. ^ Houston, Stephen D.; Robertson, J; Stuart, D (2000). “The Language of Classic Maya Inscriptions”. Current Anthropology. 41 (3): 321–356. doi:10.1086/300142. ISSN 0011-3204. PMID 10768879. ^ “History: Site Overview”. Caracol Archaeological Project. Department of Anthropology, University of Central Florida. Retrieved 19 February 2014. ^ a b c Johnson, Melissa A. (October 2003). “The Making of Race and Place in Nineteenth-Century British Honduras”. Environmental History. 8 (4): 598–617. doi:10.2307/3985885. hdl:11214/203. JSTOR 3985885. ^ Swift, Keith (1 September 2009). “St. George’s Caye Declared a Historic Site”. News 7 Belize. ^ “3° & 4° Gulielmi IV, cap. LXXIII An Act for the Abolition of Slavery throughout the British Colonies; for promoting the Industry of the manumitted Slaves; and for compensating the Persons hitherto entitled to the Services of such Slaves”. Retrieved 14 August 2015. ^ Greenspan, (2007). Frommer’s Belize. John Wiley & Sons. pp. 279–. ISBN 978-0-471-92261-2. Retrieved 15 August 2012. ^ Merrill, Tim, ed. (1992). “Relations with Britain”. Belize: A Country Study. GPO for the Library of Congress. ^ “Belize 1981 (rev. 2001)”. Constitute. Retrieved 30 March 2015. ^ a b Phillips, Dion E. (2002). “The Military of Belize”. Archived from the original on 11 December 2012. ^ “Channel 5 Belize” (28 November 2005), “Belizean Coast Guard hits the high seas”. Archived from the original on 4 May 2011. Retrieved 26 April 2010. ^ “Belize”. CIA World Factbook. Archived from the original on 13 May 2013. ^ a b “Belize”. CIA World Factbook. Central Intelligence Agency. Archived from the original on 13 May 2013. Retrieved 13 January 2016. ^ Staff (10 April 2019). “Guatemalan President teaches students to draw Guatemalan map with Belize included”. San Ignacio, Belize: Breaking Belize News. Retrieved 10 April 2019. ^ “Belize-Guatemala border tensions rise over shooting – BBC News”. BBC News. 22 April 2016. Retrieved 11 September 2016. ^ “ACP-EU summit 2000”. Hartford-hwp.com. Retrieved 29 August 2010. ^ “Belize to hold a referendum on Guatemala territorial dispute – Durham University”. www.dur.ac.uk. Retrieved 2018-10-24. ^ Staff (10 April 2019). “ICJ Referendum postponed until further notice”. San Ignacio, Belize: Breaking Belize News. Retrieved 10 April 2019. ^ “The Full Participation of Belize’s Indigenous People is Crucial to Achieving the Sustainable Development Goals”. Retrieved 2018-10-23. ^ “Historic Legal Victory for Indigenous Peoples in Belize | Rights + Resources”. Rights + Resources. Retrieved 2018-10-23. ^ “SATIIM launches Maya lands registry to celebrate UN Indigenous Peoples day”. Breaking Belize News-The Leading Online News Source of Belize. 2017-08-09. Retrieved 2018-10-23. ^ “SATIIM launches Maya lands registry to celebrate UN Indigenous Peoples day”. Breaking Belize News-The Leading Online News Source of Belize. 2017-08-09. Retrieved 2018-10-24. ^ “Historic Legal Victory for Indigenous Peoples in Belize | Rights + Resources”. Rights + Resources. Retrieved 2018-10-24. ^ “The Full Participation of Belize’s Indigenous People is Crucial to Achieving the Sustainable Development Goals”. Retrieved 2018-10-24. ^ “About The Dispute – Belize Referrendum”. belizereferendum.gov.bz. Retrieved 2018-10-24. ^ “Move to Belize Guide”. Belize Travel Guide. March 2012. Archived from the original on 21 October 2012. ^ “BERDS Topography”. Biodiversity.bz. Archived from the original on 12 September 2010. Retrieved 29 August 2010. ^ “Small And Isolated, Belize Attracts Drug Traffickers”. NPR. 29 October 2011. ^ “Mexican drug cartels reach into tiny Belize”. The Washington Post. 28 September 2011. ^ Moon Handbooks (2006). “Know Belize – Flora & Fauna”. CentralAmerica.com. Retrieved 15 February 2008. ^ “BELIZE”. Encyclopedia of the Nations. 2007. Retrieved 15 February 2008. ^ a b c Cherrington, E. A., Ek, E., Cho, P., Howell, B. F., Hernandez, B. E., Anderson, E. R., Flores, A. I., Garcia, B. C., Sempris, E., and D. E. Irwin. (2010), “Forest Cover and Deforestation in Belize: 1980–2010.” Water Center for the Humid Tropics of Latin America and the Caribbean. Panama City, Panama. ^ “Biodiversity in Belize – Ecosystems Map”. Biological-diversity.info. August 23, 2005. Archived from the original on 22 September 2010. Retrieved 29 August 2010. ^ Cherrington, E. A., Hernandez, B. E., Trejos, N. A., Smith, O. A., Anderson, E. R., Flores, A. I. and Garcia, B. C. (2010) “Identification of Threatened and Resilient Mangroves in the Belize Barrier Reef System.” Technical report to the World Wildlife Fund. Water Center for the Humid Tropics of Latin America and the Caribbean (CATHALAC) / Regional Visualization & Monitoring System (SERVIR). ^ “Belize”. ProtectedPlanet. Retrieved 10 December 2015. ^ “Costa Rica”. ProtectedPlanet. Retrieved 10 December 2015. ^ Ramos, Adele (2 July 2010). “Belize protected areas 26% – not 40-odd percent”. Amandala. Archived from the original on 14 May 2011. ^ “Biodiversity in Belize – Deforestation”. Biological-diversity.info. 23 August 2009. Archived from the original on 22 September 2010. Retrieved 29 August 2010. ^ a b c Burnett, John (11 October 2006). “Large Oil Field Is Found in Belize; the Angling Begins”. npr.org. ^ a b Harrabin, Roger (12 June 2006). “Reef at forefront of CO2 battle”. BBC News. ^ “Belize Barrier Reef Reserve System – UNESCO World Heritage Centre”. UNESCO. Retrieved 23 December 2015. ^ “Guatemalans trawling in Belize’s southern waters”. Channel 5 Belize. 27 February 2013. Retrieved on 28 February 2013. 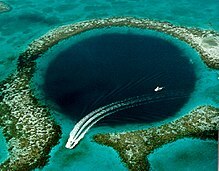 ^ “Belize Bans Bottom Trawling in Exclusive Economic Zone”. Oceana.org.8 December 2010. Retrieved on 28 February 2013. ^ “Government Implements Ban On Offshore Drilling”. 7 News Belize. Retrieved 23 December 2015. ^ “Coral Collapse in Caribbean”. BBC News. 4 May 2000. Retrieved on 21 October 2011. ^ Brown, Daniel & Berg, Robbie (October 25, 2010). “Hurricane Richard Discussion Seventeen”. National Hurricane Center. Archived from the original on 29 October 2010. Retrieved 25 October 2010. ^ Oancea, Dan (January 2009). “Mining in Central America” (PDF). Archived from the original on 16 May 2011. Retrieved 16 May 2011. CS1 maint: BOT: original-url status unknown (link). magazine.mining.com. pp. 10–12. ^ “Production of Crude Oil including Lease Condensate 2016” (CVS download). U.S. Energy Information Administration. Retrieved 27 May 2017. ^ a b “Background Note: Belize”. Department of State, United States. ^ “Government of Belize Announces Intent to Acquire Control of Belize Electricity Limited”. Fortis Inc. St. John’s, Newfoundland, Canada. 13 June 2011. Archived from the original on 17 October 2014. Retrieved 4 October 2016. ^ 2012: A Remarkable Year for Belize’s Tourism Industry. San Pedro Sun Newspaper (8 February 2013). Retrieved on 6 March 2013. ^ “Belize Population – Demographics”. www.indexmundi.com. ^ Cho, Julian (1998). “Maya Homeland”. Archived from the original on 3 February 2010. Retrieved 3 February 2010. . University of California Berkeley Geography Department and the Toledo Maya of Southern Belize. Retrieved 4 January 2007. ^ “Belize-Guatemala Territorial Issue – Chapter 1”. Belizenet.com. Retrieved 29 August 2010. ^ a b c Johnson, Melissa A. (2003). “The Making of Race and Place in Nineteenth-Century British Honduras”. Environmental History. 8 (4): 598–617. doi:10.2307/3985885. hdl:11214/203. JSTOR 3985885. ^ a b Crawford, M.H. (1997). “Biocultural adaptation to disease in the Caribbean: Case study of a migrant population” (PDF). Journal of Caribbean Studies. Health and Disease in the Caribbean. 12 (1): 141–155. Archived from the original (PDF) on 5 November 2012. ^ a b “Belize 2000 Housing and Population Census”. Belize Central Statistical Office. 2000. Archived from the original on 28 June 2012. Retrieved 9 September 2008. ^ “Mestizo location in Belize; Location”. Archived from the original on 14 February 2008. Retrieved 14 February 2008. ^ a b “Northern Belize Caste War History; Location”. Retrieved 21 February 2013. ^ Gingerich, Melvin and Loewen, John B. (May 2013) “Belize”. Global Anabaptist Mennonite Encyclopedia Online. ^ “Diaspora of Belize”. Council on Diplomacy, Washington, D.C. and Consulate General of Belize. ^ “People of Belize”. Archived from the original on 15 July 2011. Retrieved 14 February 2008. ^ Holland, Clifton L. (8 September 2011). “National Census of Belize Religious Affiliation, 1970–2010” (PDF). Retrieved 8 May 2017. ^ “Orthodox Church of Belize homepage”. Orthodoxchurch.bz. 22 August 1982. Retrieved 29 August 2010. ^ “Most Baha’i Nations (2005)”. The Association for Religion Data Archives. Retrieved 21 November 2015. ^ “Belize: Religious Adherents (2010)”. The Association for Religion Data Archives. Retrieved 21 November 2015. ^ “Chief and two new justices sworn in”. News 5 Belize. 1998-02-02. Retrieved 2012-04-20. ^ “Immigrant Stories: Belize”. Sikh Global Village. Retrieved 2012-04-20. ^ “Muslim community officially opens Belize City Mosque – Channel5Belize.com”. channel5belize.com. ^ “A History of Muslims in Belize”. Aquila Style. ^ “Belize Demographics Country Profile 2013 – With Belize Census Data”. ^ “7 News Belize”. 7newsbelize.com. ^ “The Open Campus in Belize”. Open Campus. The University of the West Indies. Retrieved 16 March 2019. ^ a b c “Belize: Country Specific Information”. US Department of State. Archived from the original on 1 May 2013. Retrieved 17 May 2012. ^ a b “Serious Crimes Comparative Summary 2006–2007”. Belize Police Department. Archived from the original on 5 June 2013. ^ Dalby, Chris (22 January 2019). “InSight Crime’s 2018 Homicide Round-Up”. InSight Crime. Retrieved 11 April 2019. ^ a b “Belize 2019 Crime & Safety Report”. Overseas Security Advisory Council (OSAC). U.S. Department of State. 14 March 2019. Retrieved 11 April 2019. ^ “Belize Murders Down Slightly, Amidst Regional Spike”. 7 News Belize. 6 January 2016. Retrieved 13 January 2016. ^ a b Rutheiser, Charles C., “Structure of Belizean Society”. In Merrill. ^ “The Global Gender Gap Report 2012” (PDF). World Economic Forum. ^ a b c “Human Development Report” (PDF). United Nations Development Programme. 2013. ^ “National Holidays of Belize” Council on Diplomacy, Washington, D.C. and Consulate General of Belize. Retrieved 5 February 2008. ^ Briceño, J. (1981). “Carnival in Northern Belize”. Belizean Studies. 9 (3): 1–7. ^ Peddicord, Kathleen (11 February 2015). “La Ruta Maya – One of the World’s Toughest and Most Historic River Races”. The Huffington Post. Retrieved 4 March 2016. ^ Staff, ed. (12 August 2016). “Belize Tourism Scores Gold With Simone Biles Tweet”. Haiti Gazette. Retrieved 27 August 2016. ^ Martin, Jill; Lopez, Elwyn, eds. (16 August 2016). “Simone Biles has support in another country: Belize”. CNN. Retrieved 27 August 2016. ^ Laymon, Terri. “Even World Champions Need A Vacation”. gymnasticsnewsnetwork.com. Retrieved August 15, 2016. Biles’ mother, Nellie Cayetano, is Belizean, while Biles herself is a Belizean-American of Garifuna descent. ^ “The National Symbols”. Government of Belize: The Official Government Portal. Government of Belize. Retrieved 11 September 2016. “Belize”. The World Factbook. Central Intelligence Agency.